St Johnstone have completed the signing of Falkirk midfielder Liam Craig on a one-month loan deal. Saints boss Derek McInnes told the club website: "I'm grateful to Falkirk head coach John Hughes for his help. "Liam has two years of SPL experience but hasn't been playing as often as he would like recently. He is left sided and he carries a goal threat as well." 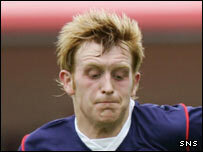 The 20-year-old, who came through the Falkirk ranks, has played five SPL games for the Bairns this season.